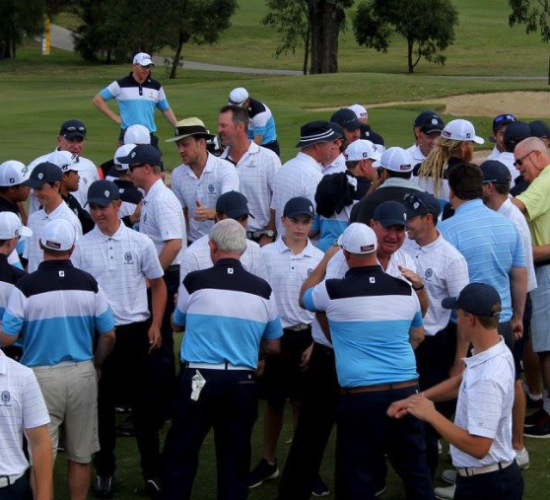 The Brisbane Golf Club yesterday realised its ‘dream’ and won the BDGA Division 1 Pennant for the first time since 1940 defeating Keperra Golf Club 13-8. 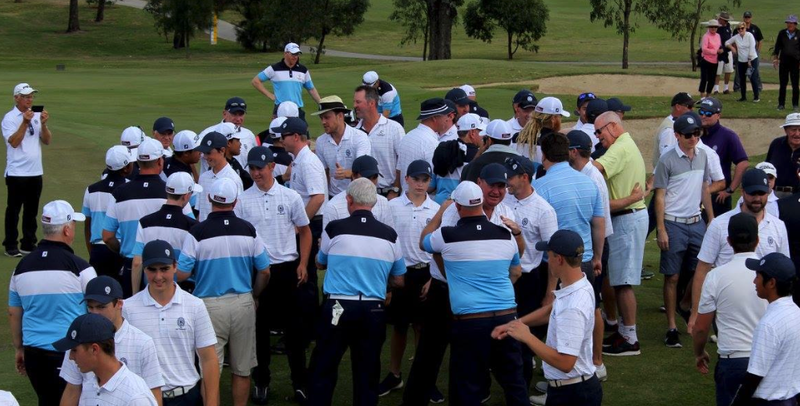 The final match of the year was a ‘grand final’ with KGC sitting first on the ladder and BGC second. Not only did BGC need to win at home to secure the title but they also needed to win by a margin of four after all 21 matches were played. Whilst the Masters had already secured their fourth Pennant win in as many years there was also an opportunity for the Juniors to win their Pennant which in many ways would be as rewarding as the overall win given the focus BGC has placed on its junior development program in recent years. Our Junior team led by our Junior Club Champion, Sam Slater started slowly, and most likely a little nervously given the circumstances, but fought back to win 3-2 with strong wins recorded by Sam Slater (1up), Ben Stieler (3&2) and Kaito Chiu (2&1). A squad of eight players including Katio Chiu, Dylan Barraclough, Jordan Hampson, Bailey Ittensohn, James Sammut, Sam Slater, Ben Stieler and Mathew Van Eden played Juniors for BGC in 2017 and it was wonderful to see the full squad supporting each other yesterday. Interestingly the average age of our Junior team is just 15 and the average handicap is 2 which provides a great foundation for further success in the future. To secure a four-point victory over KGC it was always going to be important for our Opens to continue their recent form at home where they had won eight matches on both occasions. Scott Bretherton (1 up) winning at Number 11 again provided the perfect start as he had on five occasions this year. Lewis Clelland (2&1) returned to the team after missing the previous week and produced a valuable point as did Jacob Clarke (1 up). Louis Dobbelaar who at just 15 played in the Opens for the second consecutive year won 1up and Kurt Carlson kept his perfect Pennants record in tact with a 1 up win. Both Tim Lukin and Stephen Cox squared their matches which was also extremely valuable given the final margin was just 5. To defeat KGC 6-5 in the Opens was one of the best performances of the year for the Opens and it came at the perfect time. A total of 15 players represented BGC in the Opens in 2017 and each were critical to the overall success of the team. The Masters were looking to complete an undefeated season and did just that producing another outstanding team performance to secure four wins. It really is difficult to put into words the quality of our Masters team who simply let their golf do the talking. Gary Brodie played the back nine -1 to win 4&3, Nicholas Woodley recorded his fourth win from four starts 4&3, Stephen Deane remained undefeated winning 3&1 and Brett Kinninmont who only lost one match this season won 3&2. Unfortunately Warwick Oxenford lost a close match 2&1 but still finished the year with a 4-2 wining record. For a number of years our Masters have been dominant both at home and away and in 2017 they secured 24.5 points out of a possible 30 points which was a winning ratio that no other team in any grade across all four divisions was able to better in 2017. Whilst three players including Kurt Carlson, Nick Woodley and Ben Stieler were undefeated in 2017 only Stephen Deane played in every round and remained undefeated. Stephen has missed only a few years of Pennants since first playing in 1980 as a Junior and in recent years as Club Captain has taken BGC from the verge of dropping to Division 4 in 2014 to winning Division 1 in 2017. What an amazing achievement and truly one that many often only dream about. BGC will defend its title in 2018 against Keperra Golf Club and Nudgee Golf Club who finished second and third in Division 1 respectively and Royal Queensland Golf Club who won Division 2 and have been promoted. The year would not had been the success it was without the support of our caddies. Additionally special thanks must go to Phil Fraser, Doug Lukin, Bruce Nicol and team photographer Renitta Flynn. All three grades also wish to acknowledge the support of Members from BGC who not only turned up in large numbers on Sunday but for all of our home matches. BGC invited five of its non-playing elite juniors and their families out yesterday and it was great for them to be included in the team photograph, provide their support and ultimately sing the team song at the presentation. We look forward to seeing them play in our future Pennant teams. Click here to see the final 2017 Division 1 Table.